This is no empty declaration. Executive Chef Brad Phillips has spent his two years at the helm building up relationships with suppliers and a kitchen staff that shares his vision. 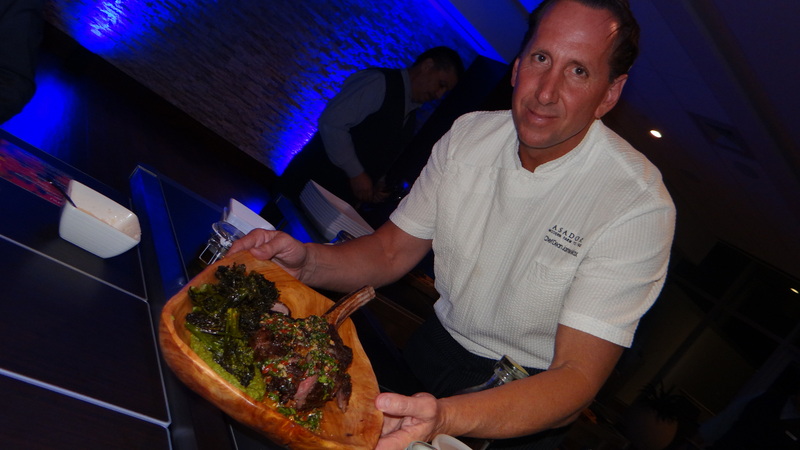 The menu now changes with the seasons, as Asador showed at a recent media event I attended designed to celebrate the Fall harvest. As Phillips excitedly took us through the menu it was obvious that just about everything had a palpable provenance. Beef cheek sliders with pea tendrils come from Hudspeth Farm and Tassione Farms. Linda Hudspeth sits at our table to vouth for the fact. Rocky Tassione is going to try to get to the meal but lost his cell phone while foraging for mushrooms the previous week so he is scrambling to reconstruct all his contacts (email tassionefarms@hotmail.com if you think you were one of those). Dennis Bryant of Louisiana Foods is in attendance. He supplies a lot of the seafood. We sample a mesquite-grilled wild tilapia (from Costa Rica). 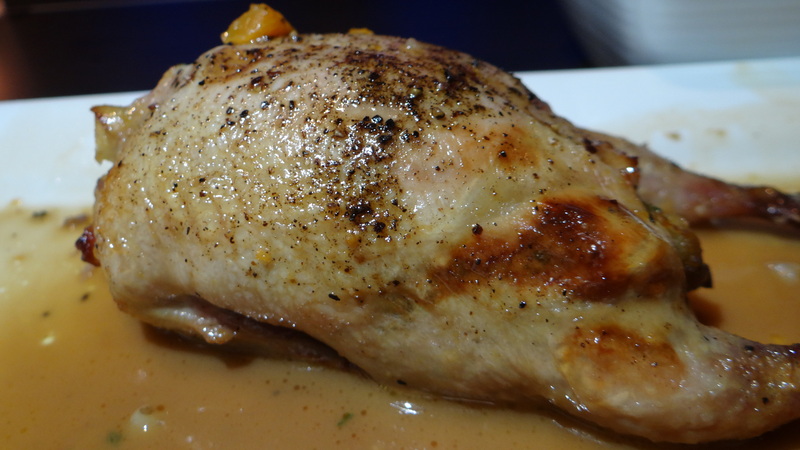 Wild tilapia is a new twist for me — I thought the fish was condemned to the farm. This may be the best representation of tilapia obtainable, but the indistinct flavor leaves me unmoved. As a colleague says, tilapia is the tofu of the sea, absorbing whatever strong flavors it is served with. Dennis’ oysters, which Crave tasted earlier this year, are the better bet. 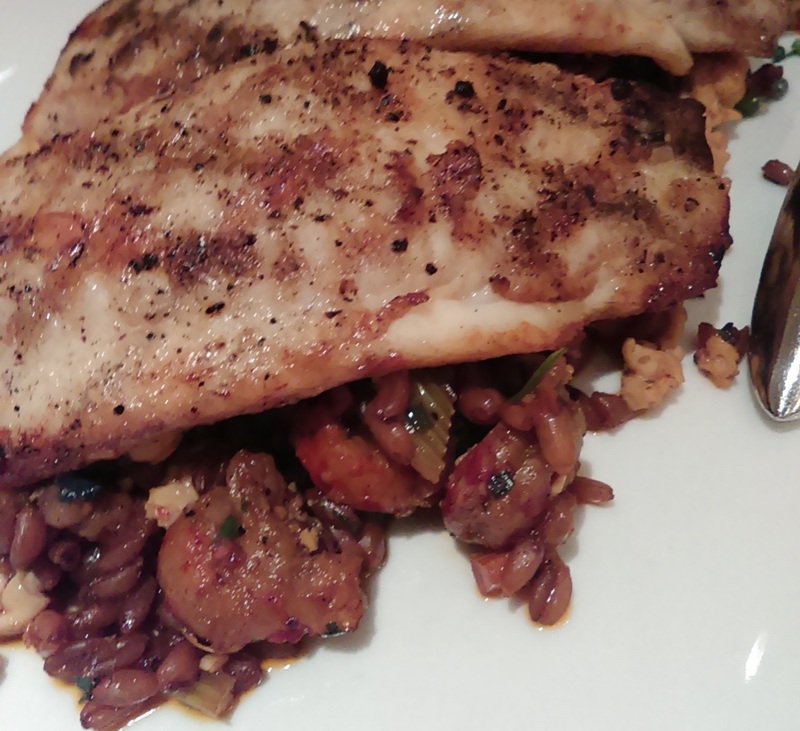 The star of the tilapia dish is what is lodged underneath the fish fillet. The excitement in Phillips voice rises as he describes the farro fried rice (the farro comes from a Columbia, South Carolina farm) mixed with brunoise mirepoix, crawfish tail meat, sambal soy vinaigrette, and chopped Swiss chard with a scrambled egg. The Farro and rice is chewy with a heart-warming long-cooked taste from the braising. Beef cheek sliders are prepared by braising the beef cheek with red wine and mirepoix for three hours, at which point the softened fibers of the beef are easy to shred. The vegetables in the braising liquid are broken up to make a thick sauce and the meat is added back to make the soft slider patty. To cut through the richness, Phillips pickled some thinly-sliced red onions and jalapeño. We gently lay these on top of the meat patty before biting in to the tasty mass. Quail (from a farm near San Antonio) comes stuffed with seasonal butternut squash stuffing and apple on a bed of Tassione Farms arugula, hakurei turnips, pickled cranberries, goat cheese (from The Mozzarella Company) quenelles, fresh watermelon radish and toasted walnuts. Paula Lambert owner/founder of The Mozzarella Company is present to see her cheese being used and seems suitably impressed. A new launch is the “Char Bar”, a selection of (mainly) house-made charcuterie and cheese. 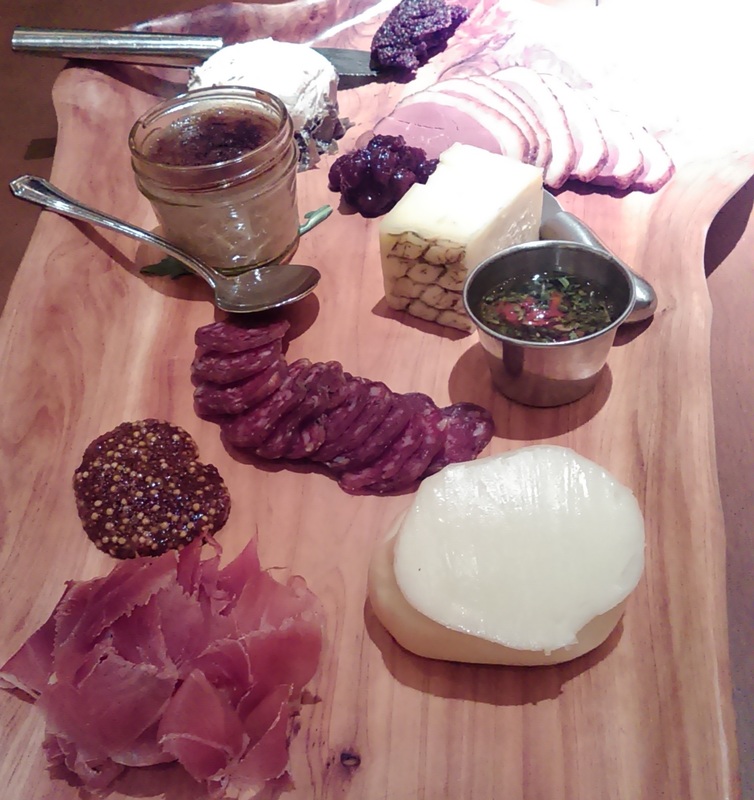 Guests choose two ($18) or three ($21) selections to build their own cured meat board. The chicken liver paté was edible velvet, the dried cherry chutney a solid piquant fruit note to accompany the earthy heirloom prosciutto, wild boar salami or house applewood-smoked duck breast. A well-chosen cheese selection is offered as part of this, and includes Mozzarella Company’s Deep Ellum Blue and Veldhuizen Paragon and Cottonwood River Cheddar (inadvertently described as Texas on the menu but from Kansas). We did not retaste the established parts of the menu but, in response to a question about what he offered the tired travelling salesman who just wanted a steak, Phillips pointed to the black angus Kansas City steak and the wood roasted flatiron so the steak house market is covered too. The strongest part of the drinks menu is the 95-selection tequila list. It is one of the best (maybe the best) in town. Craft beer gets a good showing too, with a dozen or so Texas selections and slightly more from elsewhere. Wine is the red-headed stepchild. Just 70 selections (priced at 3 times plus over retail) but partly offset by a large by-the-glass collection. Despite the fanaticism about local sourcing, there is not a single Texas wine on the list, an oversight that Senior Beverage and Food Manager, John McAuliffe, says that he is in the process of correcting. This menu is also available to events in the new banquet facility. So is Asador worthy of destination status? The food comfortably passes the test. The decor and ambiance of the restaurant also makes the cut. I have not experienced regular ‘anonymous patron’ service yet so that is left as an exercise for the reader. 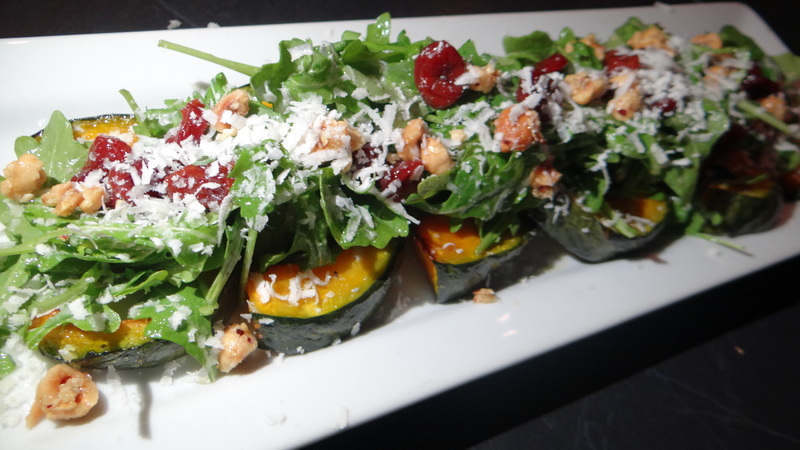 There is nothing chain-like about the experience and the menu changes frequently. On this scorecard, I would grant Asador its claim and recommend a visit. Overall, it comes Crave Recommended. I don’t think a name change would be out of the question. Worst name in the USA…..